Ok so I had made Zeppole, time for the american version of a doughnut. 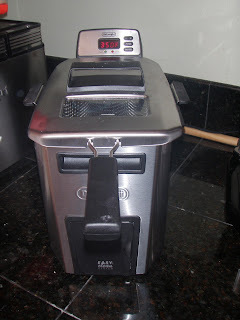 I finally got my deep fryer that I have been wanting forever. So I made chocolate doughnuts that had all of us coming back for more. It was a lot of fun to make and pretty simple. Combine sugar, salt, yeast and 1 1/2 cups flour in a mixing bowl . Heat the milk and butter together to 130 degrees (you can heat them in a microwave for about 1 ½ minutes on high, or heat in a saucepan ). Add the warm liquid to the dry ingredients in the mixing bowl . Stir in the yogurt. Beat in the eggs and yolks. Beat at medium speed for 2 minutes. Stir in 3 ½ cups flour, then knead for about 10 minutes, kneading in additional flour ¼ cup at a time. The dough will be on the sticky side. Transfer to a large, buttered bowl. Flip the dough over, so the top has a light layer of butter from the bowl, to prevent the dough from drying out. Cover with a towel, and let rise in a warm place for about 1 hour, or until doubled in volume. The dough will lose its stickiness as it rises. Roll the dough to about 1/3” thick. Cut with a 2 ¼” donut cutter, or just cut into circles or diamonds. 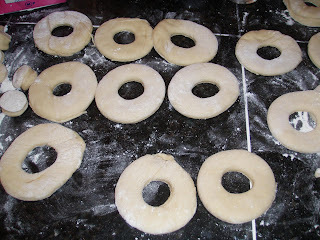 Place the donuts and holes on a baking sheet, cover with a towel, and let rise until doubled, about ½ hour to 45 minutes. 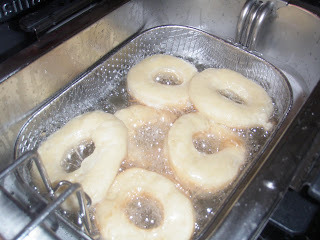 fry the donuts in batches in 350 degree oil for about 1 minute each side. Drain on paper towels, then glaze with chocolate glaze. 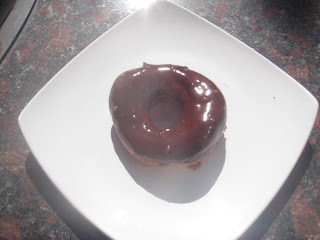 chocolate glaze: Combine the butter, cream, and chocolate chips in a microwave-safe glass bowl. Microwave on high for 1 minute. Stir, then microwave 30 seconds. Repeat until you have a smooth mixture. Stir in the vanilla, then the powdered sugar. Stir in the corn syrup. 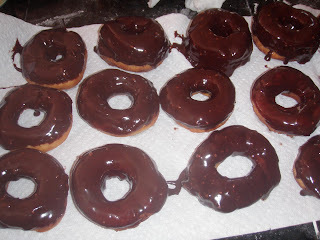 Dip the tops of the cooled donuts into the chocolate glaze. You can eat them right away, or let the glaze harden for ½ hour first. Makes about 30 donuts and holes. Here is my yummy doughnut.